Do you have a passion for biking? Does the thought of donning a pair of tight-fitting cycling shorts and your cycling jersey and jumping on your road bike for a quick 30-mile ride leave you drooling? I met Matt Appleman, the owner of Appleman Bicycles several years ago when I was selling my first carbon fiber road bike to another cyclist through Craigslist. The buyer asked Matt to check the carbon fiber frame for wear, tear and cracks. 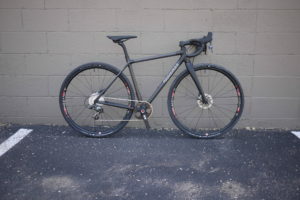 Based on Matt’s expertise, it passed and I completed the sale, but not without learning more about Matt and his passion for making custom carbon fiber road, mountain and cyclocross bike frames. Since then, we’ve stayed in touch. We’ve met for coffee a number of times where we’ve talked about the direction of his business. As someone who loves cycling and also loves creativity, I wanted to share the Appleman bike story with those who will appreciate Matt’s entrepreneurial spirit, and his dedication to the art and science of design. What I’ve learned from Matt is that he is unrelenting in his pursuit of mastering carbon fiber design. He just keeps at it. Each and every learning goes into the next bike he creates – a continuous focus on quality. Matt surpassed the 10,000 hours to master carbon fiber design long ago (the 10,000 hour concept was proposed by business author Malcolm Gladwell in his book, “Outliers”). Matt’s work demonstrates that where there is room to improve, we should never be satisfied. Stay curious. Stephen Dupont: Hey Matt, how did you get into biking? Did you bike as a kid? Matt Appleman: During the summer of 1996, I was going into fifth grade and I happened to see a full-page caricature of the Atlanta Olympic mountain bike course. Ever since then, I’ve been riding more than the average Joe! It started out riding on the grass NEXT to the paved bike path… real mountain biking. Over the next few years I refined what riding was and started racing on the road once I felt how fast you could go! The Youth Cycling League (YCL) turned me on to the road. Stephen Dupont: What was the Youth Cycling League? Matt Appleman: YCL was a group formed to get kids in elementary and middle school into cycling and racing. Well, it certainly worked for me! They had a few teams around the Twin Cities and you’d have a weekly practice with the team closest to where you live. They had races, but it really wasn’t focused on racing. It truly was focused on fun and becoming a better rider. It didn’t matter what kind of bike you had, but when I found out that a road bike was much faster rolling than a mountain bike, I was hooked! Stephen Dupont: What was your very first bike? Matt Appleman: The first bike I remember (when I started “mountain biking”) was a grey and green Huffy BMX-style thing that quickly got replaced by a Schwinn Frontier (I was riding rigid almost before it was cool)! Stephen Dupont: Out of all the bikes you’ve owned, what’s your favorite? Matt Appleman: My favorite bike is what I call my “DNA Bike.” It was the first bike I built in a true “Appleman style” with carbon fiber drop outs and cable stops…the whole nine yards. I wrapped the entire frame with really thin strips of carbon fiber to form a double helix modeled after human DNA. It’s a work of art. In a way, I may never build a bike like that again. It was so much work and I learned so much, it was true north to what I’m building right now. Every bike I build has it’s roots, or DNA, in that bike. Stephen Dupont: Did you do any competitive cycling? Matt Appleman: I started racing when I was 12. I raced road and track and did just about every race up until I went off to college. In college I started the Winona State University cycling club and had a blast teaching new riders how to ride and race. After college I took a few years off from racing, but always rode. 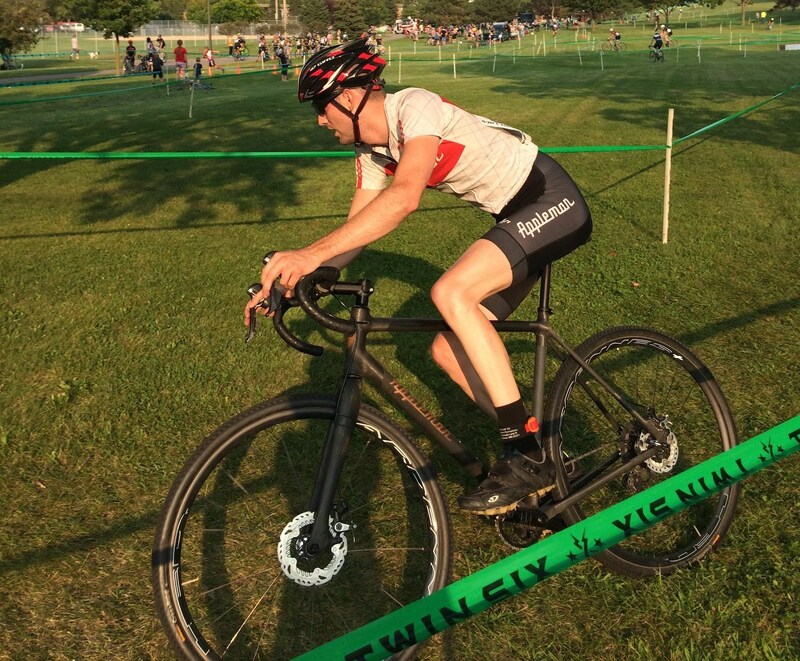 Now, I race gravel, cyclocross, and Strava. Stephen Dupont: Where did you go to high school? Matt Appleman: Armstrong High School, 2004, in Robbinsdale, Minn.
Stephen Dupont: You went to Winona State University and study composite engineering. What drew you to that area of study? 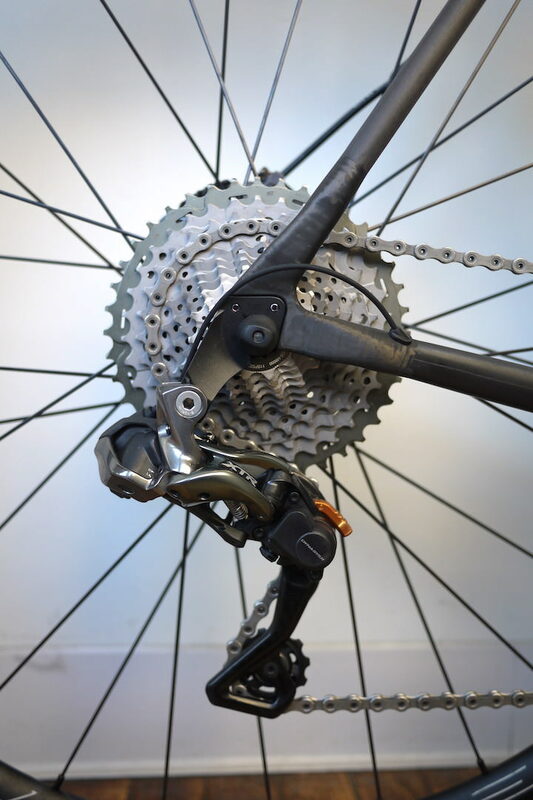 Matt Appleman: I have always liked science… and the technology of bikes. I really didn’t know what engineering was at that point, but I liked chemistry, physics, biology, and well, all of the sciences. I found out that engineering uses a bunch of different sciences, so I was in. I also had just received my first carbon fiber bike so it was really a match made in heaven. Stephen Dupont: Were you inspired by any teachers or coaches in your life — at Armstrong, Winona State, or when you worked for the aerospace company? Matt Appleman: My bike coach, Kevin, was great. Not only did he teach me to chill out about training, but also that engineering is tough… really tough. It took him five times to get through Calculus 4 and it took me four times and I was ok with that. Stephen Dupont: What fascinates you about composite materials? Matt Appleman: They’re directional and finite. With metals, they don’t have much of a direction, they’re equally strong in every direction, but with carbon fiber it’s 70 times stronger along the “grain” than against it. It opens up so many possibilities to design and work with carbon. It’s also a layered structure. Kind of like a stack of fabric. With metal you can cast something with different thickness and it is what it is, but with carbon, you have layers and to change the thickness you have to add or remove layers. Carbon fiber is kind of like Legos. You need to build up your structure whereas metals are like clay, you can sculpt them in a way you just can’t with carbon. Stephen Dupont: Were you the kind of kid who did science experiments at home? 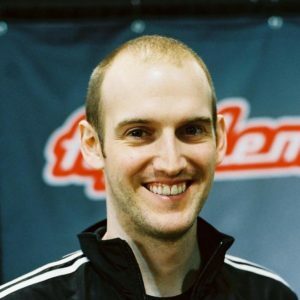 Matt Appleman: I didn’t turn into that kid until I went to college and started building carbon fiber tubes and joints in my dorm room and doing destructive testing! Stephen Dupont: Who are your heroes? Who do you admire? Matt Appleman: My family is quite admirable! My parents, sister, wife, in-laws, even my goofy dog — all have great qualities that I admire and cherish. Stephen Dupont: When and where did you get the idea to build your own bikes? What inspired you? Was it a friend who bought a custom made bike? Or an article that you read? 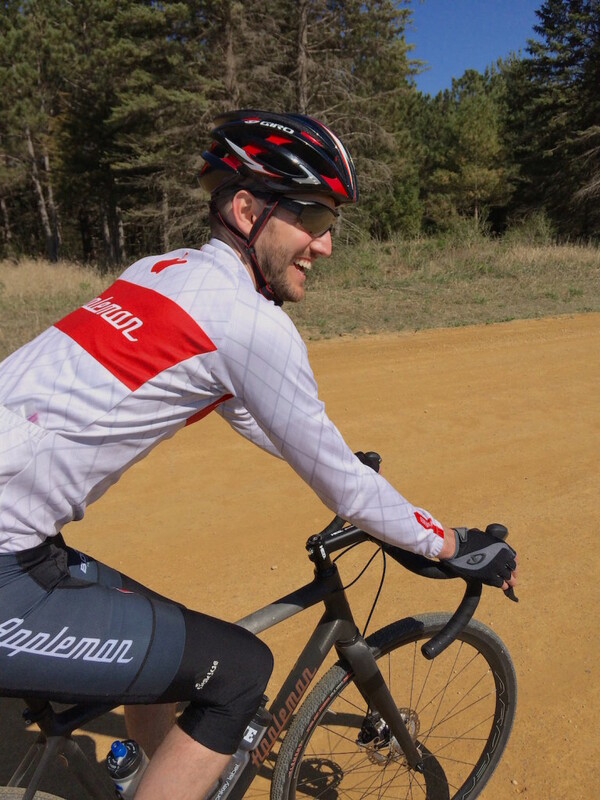 Matt Appleman: I had a knee injury in college because of an ill-fitting bike. To get back to riding comfortably I needed a custom frame. This opened the door to the custom bike world for me. When I graduated I had to choose to buy a custom bike or build one myself. I chose the latter. Stephen Dupont: What did you learn from your work at designing wind turbines and aerospace parts that you brought to making carbon fiber bikes? Matt Appleman: You know, it’s kind of funny. I can’t say that I build my bikes like I build wind turbines or like aerospace parts. But, through my work I became exposed to different techniques, methods, and materials, which gave me a really deep understanding of the material and helped me to create my own process in building bikes. Bikes are so unique and require a really specialized method to build them. I learned the strengths of carbon fiber, but more importantly the weaknesses and how to build a solid structure that is built to last. Stephen Dupont: What do you like about carbon fiber as a material? Why not make bikes out of titanium or steel, like others? What makes carbon fiber a great material for a bike frame? Matt Appleman: I love carbon! It’s almost as simple as that. I’m obsessed with the stuff. You can build a bike that rides better than any other material because of the way you can tailor the material. 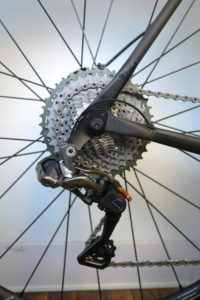 It’s not just about if a bike is stiff or not. It’s about how that bike is stiff. 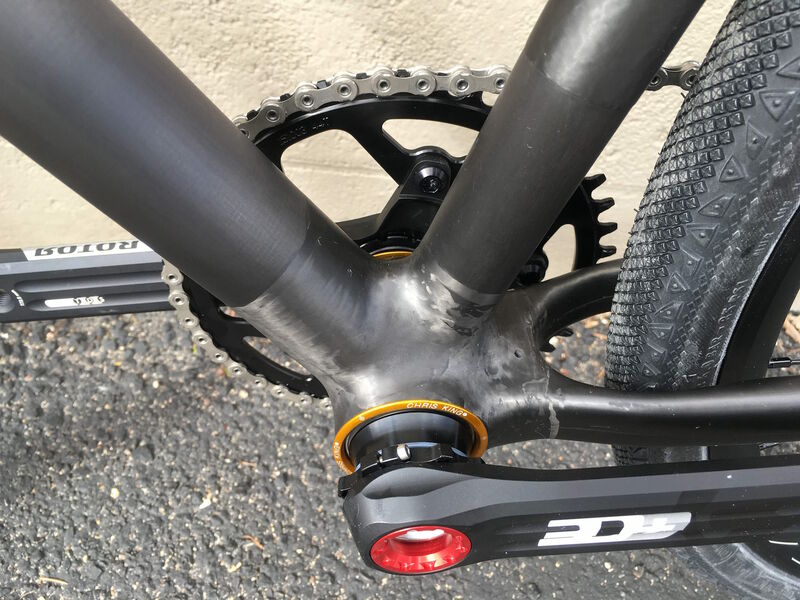 There are a handful of different types of stiffness (like compression, torsion, flex) that can be individually controlled by smart design, which in turn allows you to build a better bike. Stephen Dupont: How do you craft a bike from carbon fiber? Are there any special processes that you use to make your bikes better than others? 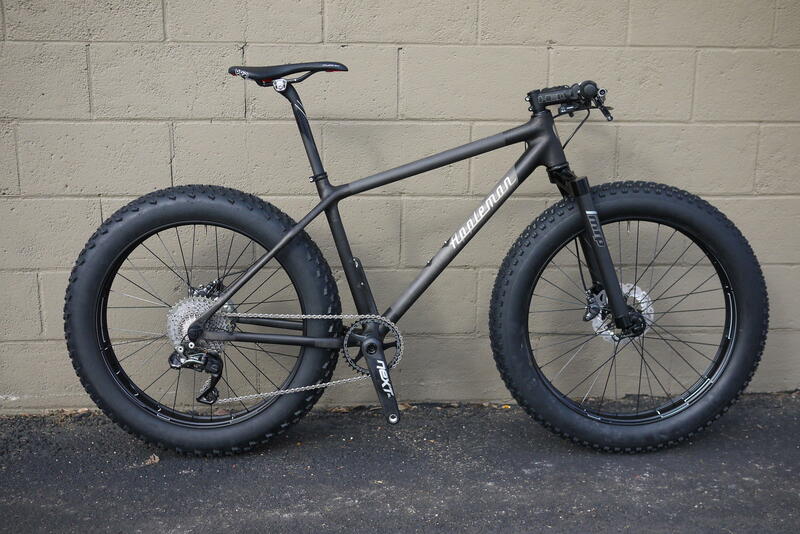 Matt Appleman: Generally speaking, I use the “tube to tube” method to build bikes. Pre-cured carbon tubes are mitered, an epoxy fillet is added, carbon is laid up on the joints and then the whole bike goes in a vacuum bag and is oven cured. That’s the big picture. People often get caught up on “is method A is better than method B?” In truth, they can both be great or poor methods depending how they are executed. How you use a method, how you perform each step of the process, and what materials you use is extremely important. It’s thousands of little details that I’ve optimized along my journey from building bikes in my dorm room to my aerospace experience to the bike frames I build now. How you cut the carbon fiber, how you form it with your hands when you apply it, and the angles you use. It’s not if you have a fillet or not, it’s the size of it, so the material doesn’t crumble. I like to build frames in a way that makes the carbon fiber be “happy,” as I would say. That might sound odd, but carbon has a personality and it doesn’t like being bent or cut in certain ways. When I build a frame, I take all that into account. Stephen Dupont: You specialize in building bikes with carbon fiber. Are there any other non-metal materials that you think would be cool to build a bike out of? Matt Appleman: Gram for gram, it doesn’t get any better than carbon fiber in the performance department. I don’t anticipate building in other materials in the foreseeable future, but renewable fibers like flax and bamboo would be fun to work with. Stephen Dupont: You don’t paint your bikes so the user can see the actual carbon fiber material. Why’s that? Matt Appleman: Correct! I don’t use any paint in my frames, even the logos! I think carbon is such an amazing material I like to highlight its natural beauty. For logos, I also use materials such as titanium, carbon fiber, wood, and a printed fiberglass. Stephen Dupont: There’s a lot of engineering that goes into making a bike for someone, but what about the art of it? Do you feel like an artist when you’re making a frame for someone? Matt Appleman: One great part about being a framebuilder is that it combines engineering and art. It’s an art to translate all the data, geometry, and engineering into an actual frame. Sure I use some formulas for designing, but there is also a lot of intuition and experience into taking something from a drawing to a rideable bike! There is a lot of art in the fabrication itself. It’s not automated and takes a lot of skill to sculpt joints and execute the look I’m going for. I don’t really feel like an artist until I complete building a frame. While I’m building it I’m not looking at artful details. But once it’s complete, I can take a step back and admire it. Stephen Dupont: What does it feel like to craft a bike for someone? Do you get into a creative flow — because you’re literally crafting one bike at a time? Matt Appleman: I’m typically “in the zone” working at the task at hand like design mode or layup mode. While laying the carbon fiber on the frame I can only listen to Vitalic, my favorite artist. Laying up a bike requires so much concentration and Vitalic’s music seems to provide the perfect ambiance for my concentration. Stephen Dupont: How do you keep improving your bikes from one year to the next? Matt Appleman: I don’t have model years or feel the need to produce something “for the 20XX season.” I’m always developing, tweaking, and testing new designs. Improvements are more of an evolution than anything else. If I make a substantial discovery, I’ll make sweeping changes. Stephen Dupont: In addition to making bikes, you’re also a business owner. What do you enjoy about owning your own business, and what don’t you like? Matt Appleman: I love the variety of things I do as a business owner. I’m fortunate to be an all-arounder. I enjoy talking with customers, building frames, and doing the accounting. While I like most of everything I do, sometimes one task will occupy more time than I’d like to give it and because I’m a one-man-band I can’t delegate that task to someone. Stephen Dupont: What do you hope to accomplish with your business? Matt Appleman: I hope to continue to deliver the best bikes I can build for my wonderful customers along with fix broken carbon frames. I’d love to work like Chris Kvale (Chris Kvale Cycles), long past my retirement age building truly amazing bikes. Stephen Dupont: Any lessons you’ve learned about running a business that you’d like to share with others who want to start a business? Matt Appleman: Regardless of how special you and your product are, plan on it taking at least five years to really get the business rolling as a well-oiled machine. Stephen Dupont: Do you feel like you’re doing what you’re meant to do with your career and life? Matt Appleman: Yeah! A bit of the backstory: neither of my parents attended college. Both had pretty typical office jobs while I was growing up and I’d hear them talk about work at the dinner table. I didn’t realize it until I owned my own a business, but those dinner table conversations helped form me into the person I am. I found out that I never really saw myself working for “the man.” I did have some real jobs that I learned a whole lot from, but they weren’t for me in the long term. I’m very fortunate to have the personality and skillset I have, otherwise I could never run a business and be happy. Thanks mom and dad! Stephen Dupont: What joy do you get out of making bike frames for others? Stephen Dupont: When someone rides one of your bikes, what do you want them to feel/experience? 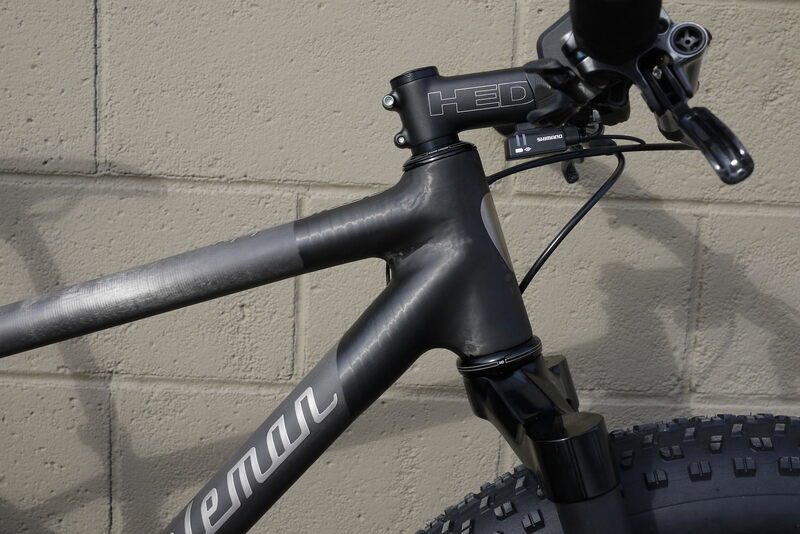 Matt Appleman: My goal is to build the last bike that you’ll ever want to ride. Sure, you may love your Appleman and eventually get a different bike, but every time you throw your leg over that new bike, my hope is that you wish you were riding your Appleman. I hope it’s the bike that all other bikes are compared to. 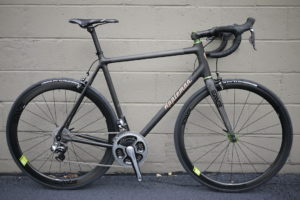 Stephen Dupont: What’s the difference between buying one of your customized frames and say, a carbon frame in the same price range from one of the major bike manufacturers? Matt Appleman: When you buy an off-the-shelf frame… it is just that. Who was it made for? Why was it made? Do you have to fit the bike or does the bike fit to you? With a custom Appleman, you get a frame built with extreme detail and personal customization. You’ll have a better riding bike with better durability than any big brand bike. I can tailor and refine the stiffness of the tubes to match your body and your riding style. The big guys… they just build a frame for the average person and hope that you’re average. Stephen Dupont: Do you have any unique stories to share about working with a customer on his or her bike? Matt Appleman: I’ve got one customer in Australia. He’s had a lot of custom bikes in the past, but couldn’t find one that was stiff enough for his 6’4″, 250-pound gear mashing body. He asked me if I could build him a custom frame that was stiff enough for his massive power. He explained that other companies had given them their stiffest tubing and it still wasn’t enough for him. I built him a fully customized frame that was super stiff. I’ve now replaced his entire fleet of bikes with a line of Appleman! It felt great to provide something that met his needs and that he really enjoys! Stephen Dupont: What are your biking dreams? Where would you most like to ride an Appleman bike? Matt Appleman: For a long time I really wanted to be pro biker… like most 14-year-olds I suppose, who dream of being pro football, hockey or basketball players. After a bit, I realized that I have the lung capacity of a ping pong ball. I still race and I’m still competitive, but I’m just not at the top of the sport. One day, though, I’d love to climb Mt. Ventoux. I absolutely love finding the roads that are off the beaten track. Stephen Dupont: So, knowing what you know now, what would you tell your 15-year-old self? Matt Appleman: I wouldn’t change a thing… except maybe telling myself that I should get a jump start on listening to electronic music!